https://www.monster-strike.com/promotion/sailormoon I thought they deserve separate thread. Very exciting as these are super pretty and cute. I'm really digging that artwork. It's very cute and well-done and a good balance between Crystal S1/2 and the 90s anime. Don't know if it's based on what the new character designs look like, but I'd be very happy if the Dream arc looks like that. Im glad they choose it too make it more like season 1/2.Instead of mixing it with season 3 style. look at the hands! well drawn, with the right tension and dynamic. You can feel strengh of the different gestures. I especially like the eyes and faces and how unique each one of them look like. This looks really good. I thought a mix between Crystal and 90's was a bad idea, but this prove me wrong. And knowing that it will be two movies, I know animation will be good. Look at SMC3, I can't help thinking it doesn't belong to the "Crystal system". I like it if these are the new looks it looks like the 90s style combined with some Crystal stuff. After some changing, now they returned to SMC 1 and 2. 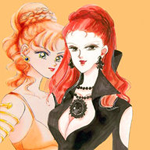 Yes, the proportions and hairstyles of the 90's anime with the details and color palette of Crystal. Oh, I wasn't sure what folks were talking about but I love what I saw when I clicked on the link. If this is the new style, I'm pleased. All we need to make sure is if they pad the movies out right. Looking good so far Ms. Moon. Love the artwork, is this going to be a collectable card game or a game of some sort? A collaboration with an rpg mobile game, for a limited time. No way! Hairstyles in 90's anime are awful!! Looks like plastic to me. I prefer Crystal 2 hairstyles (the ones from episode 25 specifically). I don'y see these have the 90s hairstyle, the hair is quite detailed. I have to say there’s something adorably retro in Usagi’s design that’s very super early ‘90s shojo manga. I strongly feel like this was drawn by Tadano or someone who has a clear grasp of her style. Even newer ‘90s artwork always looked a bit off in that it wasn’t QUITE like Tadano’s (or Itoh) despite being a good imitation. Even with retaining a lot of aspects of Crystal, these designs have an uncanny resemblance where it seems a lot more than just imitation... Like they got the essence down. It’s hard to put in words. But it would make a ton of sense if it was her or at least based on the designs she’s working on. It’s hard to think of it as a coincidence when we know she’s working on the movies and I think it’s clear they brought her in to give the designs more of a ‘90s flavor... which is exactly what we’re seeing here. The only thing it’s odd that they would debut it for a game collab but since they’re in their season 1 uniforms, it might just be a stealthy way to see how fans will react. The color, poofiness and zigzags are very much in the style of Sako’s work. 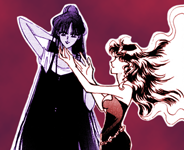 But the hair looking less big, Mars’ bangs and Usagi’s odango are distinctly ‘90s.